Stick weaving looms are probably the easiest loom on earth to work with. They are just little dowels with points on one end and holes in the other. BUT this does NOT limit the incredible creative possibilities that they have! 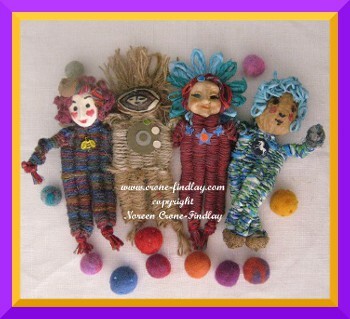 I have designed 13 enchanting little dolls (they are about 5 inches tall) to weave with only 4 of the weaving sticks. They are adorable! In this PDF pattern, (16 pages), you will also learn how to carve the neatest faces from avocado pits (really!) in a tutorial with step by step photos. Another step by step photo tutorial shows how to make Cornstarch clay and carve simple but effective faces with it. Avocado faces end up looking like carved wood, and both they, and the cornstarch clay faces are remarkably sturdy and durable. There are also how to photos for faces made in unusual ways: using buttons, paper, wood veneer, found objects, stones and twig slices. 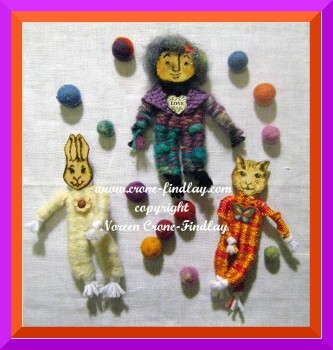 There are many different methods shown for how to finish the heads, and as always, with Noreen’s patterns, the step by step photos showing exactly how to do each step are comprehensive and clear. 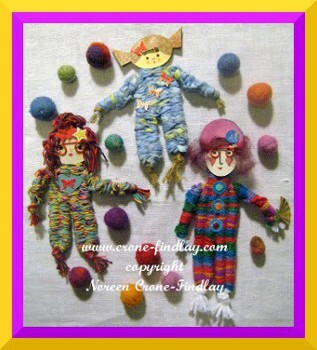 The pattern shows how to use fabric strips, handspun paper, jute, and even sewing machine thread to weave these dolls. This pattern is COMPLETELY DIFFERENT than the dolls woven with the 6 stick technique. Aw, thank you so much, Aleksa! When people ask me why I love doll making so much, the answer is easy- It’s because I am endlessly intrigued by the human form and by exploring the idea of ‘human-ness’ in expressing that fascination. Also, I love fiber and the myriad ways that it can be manipulated. It’s painterly and sculptural at the same time. It’s a blending of many strands coming together in a lovely serendipity!